In a statement concluding talks among the pro-opposition "Friends of Syria" group in Istanbul, Secretary of State John Kerry announced Washington’s intention to double non-lethal assistance to the Syrian opposition, as well as provide additional humanitarian aid to Syrians in need. The new non-lethal assistance underscores the United States’ firm support for a political solution to the crisis in Syria and for the opposition’s advancement of an inclusive, tolerant vision for a post-Assad Syria. The United States will work with the Syrian Coalition and other opposition representatives to determine how the new $123 million in non-lethal assistance can best support their efforts to meet the needs of the Syrian people and lead the way to a political transition that will bring an end to this conflict, and build the inclusive, democratic Syria that its people deserve. This new pledge brings our total non-lethal assistance to the Syrian opposition and civil society groups to $250 million. The United States will also use a portion of this non-lethal assistance to implement President Obama’s directive to provide an expanded range of support to the Supreme Military Council (SMC). We intend to expand this new support beyond military food rations and medical kits to include other types of non-lethal supplies, which would be determined in collaboration with SMC leadership. Secretary Kerry urged international partners gathered in Istanbul, as well as all Friends of the Syrian People, to make similar pledges of assistance to the Coalition and the Supreme Military Council with the goal of reaching $1 billion in total international support for the opposition. In recognition of the devastating humanitarian situation as a result of the crisis in Syria, Secretary Kerry also announced nearly $25 million in additional food assistance for the Syrian people. This aid will provide 25,500 metric tons of wheat – providing four months’ supply of flour to over one million people – as well as food rations for those inside Syria and refugees in Jordan affected by the violence. The United Nations World Food Program will begin distributing the wheat to those in need in all 14 Syrian governorates as quickly as possible. The United States is the largest donor of food assistance both within Syria and for refugees in the affected neighboring countries and is providing a total of over $409 million in humanitarian assistance for the Syrian crisis. But the U.S. pledge fell short of opposition demands for foreign backers to supply the rebels with arms, institute a no-fly zone and carry out airstrikes on positions used by President Bashar al-Assad’s regime to launch ballistic missiles on civilian areas. Top diplomats from the 11-nation core group of the "Friends of Syria" -- including the United States, Turkey, Britain, Italy, Germany, France, Qatar, Saudi Arabia, Jordan, Egypt and the UAE -- took part in the more than six hours of talks in Istanbul on Saturday. 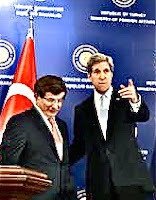 Turkish Foreign Minister Ahmet Davutoglu later told a joint press conference with Kelly that two documents were distributed to the media representatives. One is a declaration by the Syrian National Coalition envisioning Syria’s future, and the second is a joint statement by the 11 foreign ministers. The full text of the latter statement is nowhere to be found on the Internet today, not even the Turkish Foreign Ministry’s website or Facebook page. Reaffirmed firm support for a political solution in Syria based on the June 2012 Geneva communiqué. Restated that Assad and his close associates have no place in Syria’s future and must cede power to a transitional executive body. Welcomed the Arab League decision to transfer Syria’s seat to the Coalition. Recognized the "need to change the balance of power on the ground" and pledged to "enhance and expand their support to all coalition institutions," including increased support to the coalition's Supreme Military Council. Urged the United Nations to immediately investigate “allegations” chemical weapons had been used in Syria, promising "severe consequences" if the claims proved to be true.